Coveney – Who was left with egg on his face? 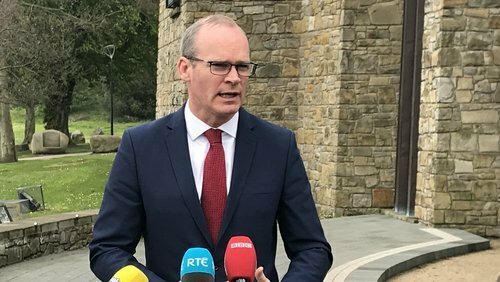 Tánaiste and Minister for Foreign Affairs Simon Coveney has said he regrets comments by a senior member of the DUP that the Government’s approach to Brexit has fractured relationships with unionists in Northern Ireland. Emma Little-Pengelle, the MP for South Belfast, made the remark last week in response to a tweet by the minister to mark the 21st anniversary of the Good Friday Agreement. In a reply, the DUP MP was highly critical of the Government. “Sad that the behaviour of the Irish government has so fundamentally fractured the carefully built relationships with unionists – the destruction of which will be so very hard to heal,” she said. The Tániaste was asked about those remarks during a visit to Downpatrick in Co Down this morning to launch a new book on St Patrick. The minister said he regularly speaks to unionists as well as politicians from all of Northern Ireland’s political parties. The Tánaiste said the government had shown it was trying to take on board concerns that everybody has, north or south of the border. He added: “I regret that she felt the need, I think she tweeted it rather than said it. The minister was also asked about a statement he made yesterday that the Government will pay for European Health Insurance Cards (EHIC) for people living in Northern Ireland after Brexit, if necessary. He said this was a contingency plan that would only be needed in the event of a no deal Brexit. The Tánaiste said everyone in Northern Ireland would benefit, regardless of whether they hold a British or Irish passport. Next Next post: The Iran Floods and US Sanctions: 10 Million at Risk, But Who Cares?